Amber is a fossil resin of conifers (cone-bearing trees) of mainly Paleogene historic period (35 to 60 million years ago). 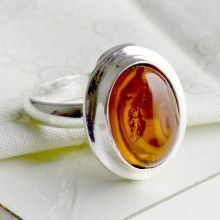 Sometimes amber has inclusions, that are bits of organic material, such as twigs, leaves or, often, insects that had been captured by the flowing tree sap millions and millions years ago. These objects are perfectly preserved in their lustrous prison, and have provided a window to the past for the scientists and exclusiveness for the amber-lovers. 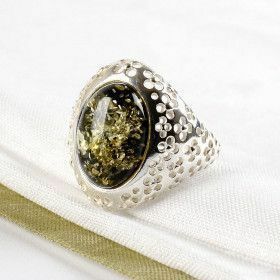 The inclusions only add to the infinite variety that characterizes amber. Amber is always so warm to the touch. That is why primitive human beings thought it to be solidified sunshine. Throughout the Middle Ages in Europe amber was valued as more precious than gold. It was believed to provide physical and spiritual benefits to its wearer, including treatment for respiratory and thyroid diseases, and arthritis. It also believed to be beneficial against fatigue and depression. 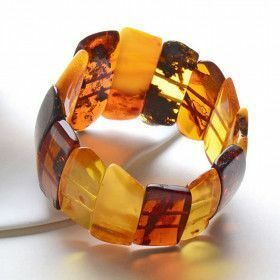 Amber brings joy to life and gives the courage necessary to overcome anxiety. Stone of the sun, amber warms the heart in literal and figurative sense and is believed to be a good remedy many ailments. 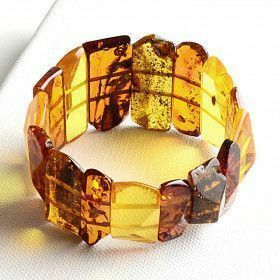 Amber is probably the first gemstone to be worn as jewelry; it was used in adornment making as far ago as Neolithic epoch of the Bronze and the Iron Ages. 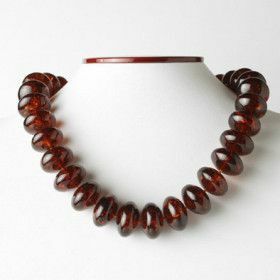 Especially wide application in producing jewelry and artistic items from amber found in 17th-18th centuries. 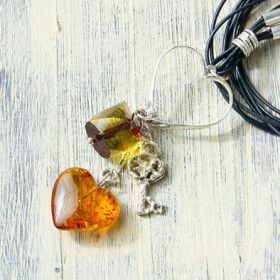 Since we use only authentic Baltic amber for our jewelry, all pieces will have their unique shapes and colors and you will never find the same one! It is highly valued for its beautiful colors, individual variations, lightweight, luster and warmth. Amber is indeed a unique gemstone that has been admired through the centuries both by the royalty and the ordinary. It is in a way an envoy from the past ascribed to possess magic and healing abilities. It is surrounded with ancient myths and legends bearing a number of poetic names such as “tears of the sea” or “gift of the Sun”. The Greeks called it elektron, from the name of the Electra giant star in the constellation of Taurus. The modern word “electricity” derives from that word that described amber. The Egyptians used it for mummification believing in its enormous life preserving qualities. The Russians have their own love of amber. The Armory Museum in Moscow Kremlin keeps tremendous amber collection that belonged to Russian Emperors’ families and the reconstructed Amber Room at the Catherine Palace near Saint Petersburg is one of the most desired tourist sights in the country. Have you ever noticed how light and warm amber is? 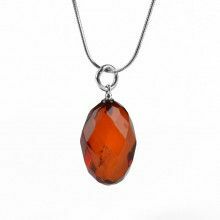 Though amber is one of the most popular gemstones so widely used in jewelry it is not quite a stone. 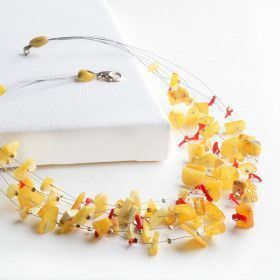 It is of organic nature, one of the organic gems together with ivory, pearls, and coral. It is fossilized resin of the specific kind of pine trees which some believe are as old as 50-60 million years. It is often found washed up on the seacoasts. Amber is so light that it can float in the salt water. Low density of amber makes it hard to imitate. Amber feels warm to the touch. It has been called “the sunny stone”. People of antiquity thought of it to be solidified sunshine. 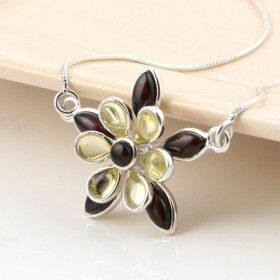 The color of the gem can vary from lemon yellow and golden shades to the deep brown and nearly black. Blue amber produced in the Dominican Republic is considered to be the rarest one. 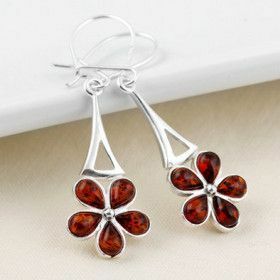 There is also green and red colored amber that is called “cherry amber”. The clarity varies from clear transparent to opaque. The most valued amber specimens have organic inclusions in them. They could be insects, leaves or twigs, air bubbles and pyrites. These objects were trapped in tree resin millions of years ago and have been preserved in a perfect shape for the scientists to explore and amber lovers to admire. Amber is the gem that has deep history. First mentioned by Theophrastus in the 4th century BC it was probably the first stone to be used in jewelry. 17-18th centuries is the period of especially wide production of amber ornaments and artistic items. Amber was valued more precious than gold in Europe in Middle Ages. 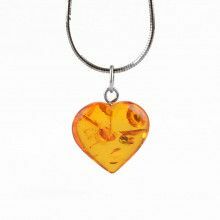 The real Baltic amber has some healing properties. 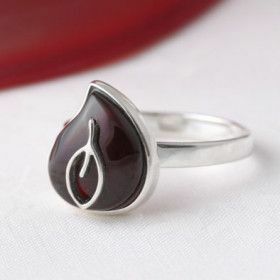 It contains succinic acid which is released by the body warmth when amber is worn. It is recommended to wear amber items during or after the illness to help the healing process. It can bring relief to many ailments, it cheers up the spirit and takes away depression and fatigue. 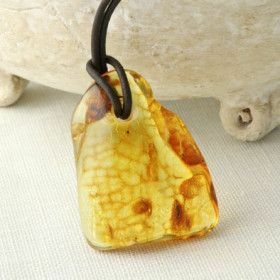 From ancient days amber has been used as amulet. 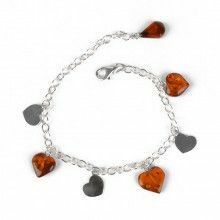 Amber is believed to be a protective gem for children and to help in the process of teething. Since the world's largest amber source is located in Russia 90% of amber is produced there west of the city of Kaliningrad in Yantarnaya Village (Amber Village). The first mentions of amber deposits of this area date back to the 12th century. The Baltic region is rich in amber that is washed ashore. Other amber sources are found in Poland, Lithuania, Italy, and Germany. Baltic amber is valued for its golden colors. 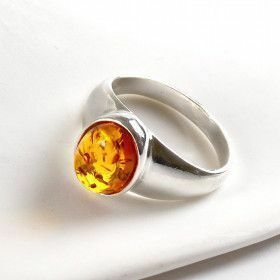 Amber that is being sold in The Russian Store is authentic Baltic amber so highly valued for its beautiful colors, unique shapes, luster and lightweight. 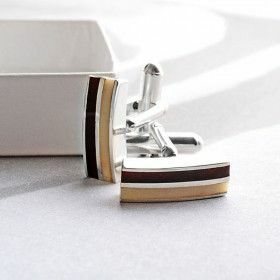 Every item is unique, so you will never find two identical jewelry pieces. 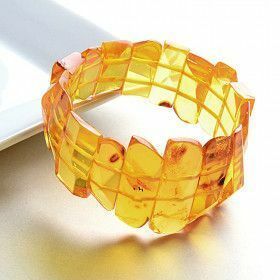 Amber is a soft gem and can be easily scratched by other decorations. So it should be kept separately and treated with care. Amber can burn releasing peculiar “pinewood” odor, which is why it was used in perfumery in the past times. Thus amber should be stored from heating to avoid damage. It is sensitive to acid, alcohol, perfume, and other beauty products. Ultrasonic cleaners should not be used for cleaning. Amber is wiped with water using a soft cloth. A drop of olive oil will renew its luster. 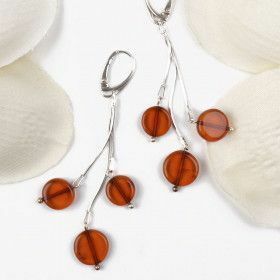 You can find more detailed instructions on cleaning your amber jewelry in our blog.